Today is the day we’ve been building up to! Rogue One: A Star Wars Story is now out on Blu-ray! We wanted to make sure you were ready for it so we’ve rounded up our trio of recipes. 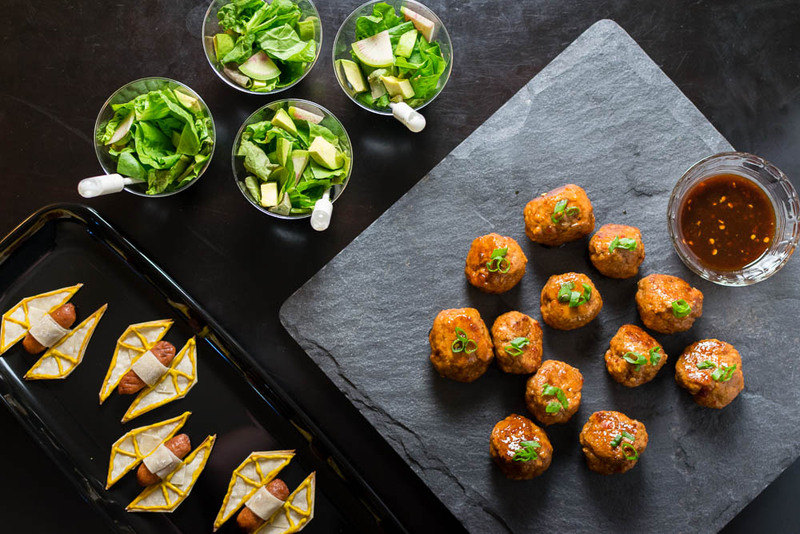 Now you have a selection of themed appetizers all in one place. We’ll also share a few of our favorite bonus features! 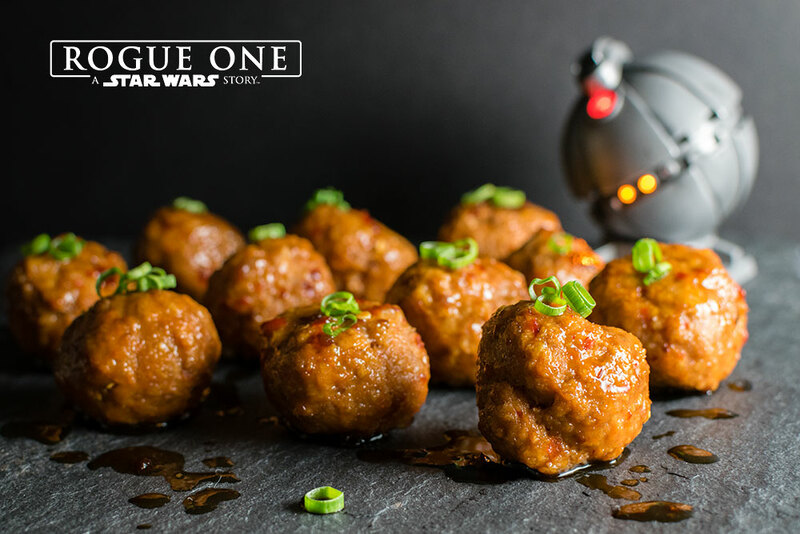 Thermal Detonators– Our Thermal Detonators are turkey meatballs with explosive flavor. The heat comes from Sambal Oelek which can be increased or decreased depending on the desired heat level. The small amount of sesame oil in the meatball keeps them juicy and delicious! Erso’s Homestead Salad– We wanted to make sure that in our trio of recipes we included a vegetarian option. 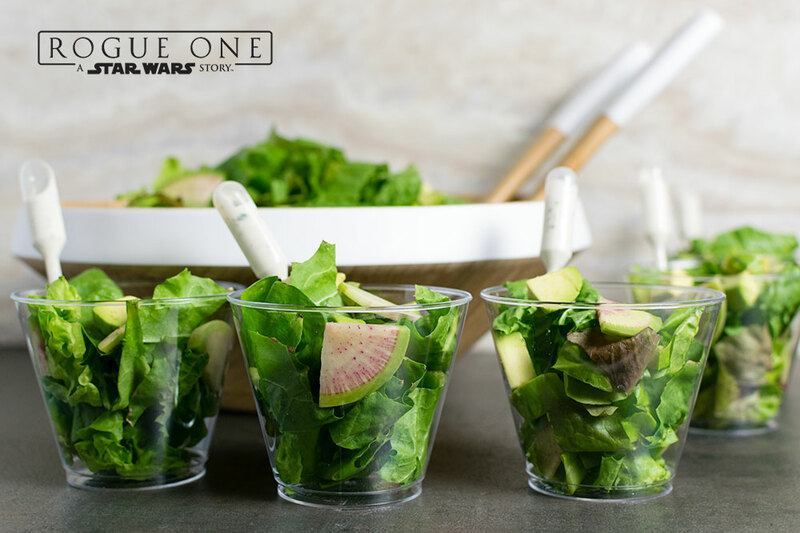 This salad fits the bill and is reminiscent of the Erso’s Homestead on Lah’mu. The dressing can even be veganized by substituting regular Greek yogurt for almond milk Greek yogurt or coconut milk Greek Yogurt. 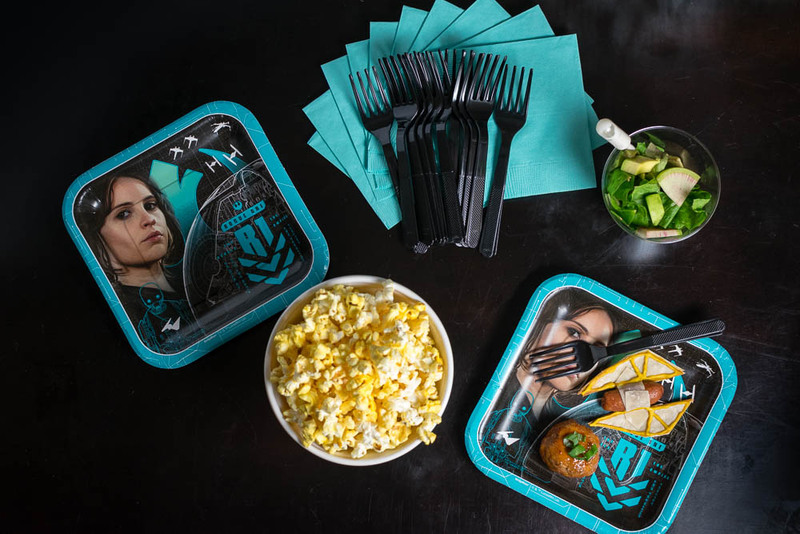 TIE Striker Appetizers– The last recipe we created was our TIE Striker Appetizers. 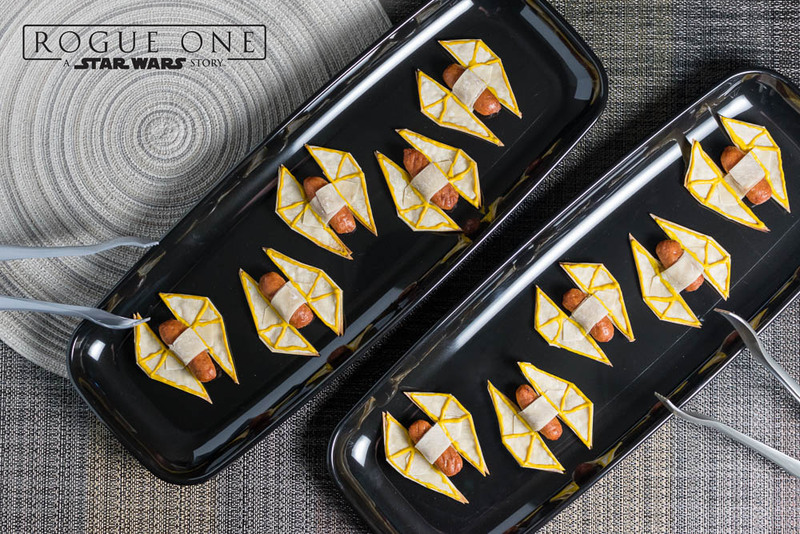 We really wanted to create a recipe in the shape of one of the starfighters in the Star Wars Universe. With the TIE Striker being so prominent in Rogue One: A Star Wars Story, they were a natural choice. Since we received an advanced copy of Rogue One: A Star Wars Story, we thought it would be fun to share our few of our favorite bonus features! All of the bonus were really fantastic and therefore hard to narrow down. However, we managed to select our 3 favorites! K-2SO: The Droid– We really loved getting to learn more about how Alan Tudyk brought K-2SO to life. It was also really interesting to see the various ways they used motion capture to create the character. Did you know that Alan Tudyk was on stilts unless it was too dangerous of a scene? The Rogue Idea– This feature was really fantastic! It focused on how the idea for Rogue One: A Star Wars Story came to be. It was great to see how all of the people involved in creating Rogue One: A Star Wars Story were die-hard fans of the series. This fandom was obviously integral in creating such a fantastic movie. The Princess and The Governor– This feature focused on how the production team created the apperances of young Princess Leia and Governor Tarkin. It was nice to see that they decided that if it wasn’t close to perfect, they weren’t interested in including it. Also, getting to see the actors behind the virtual mask was really neat! 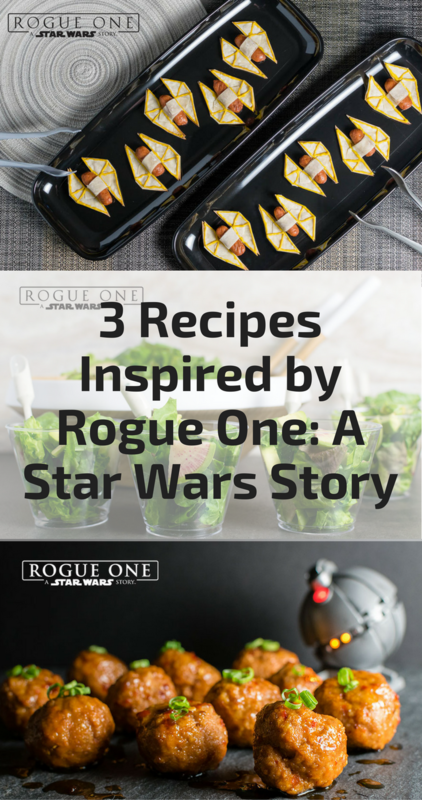 We hope you’ve enjoyed our recipes and mini review of the special features of Rogue One: A Star Wars Story! Be sure to pick up your copy today! Those turkey meatballs sound awesome! I might possibly be the last person in the world who has never seen the original Star Wars even. What a fantastic star wars themed spread! Love this. Perfect for my sons Star Wars birthday! Hahah I love the last one!! They are spot on great job! And ok I’ll admit I may not be the biggest Star Wars fan but those turkey meatballs I can totally become a fan of!